For the men - Virginia Cavaliers! Who took home the title winning 85 - 77 in a thrilling OT game. For the women - Baylor Bears! Another great game with Baylor sneaking by with an 82 - 81 victory. If you’re only my email list (and you should be), you’ll see that after the men’s Final Four was announced I predicted Virginia vs Texas Tech in the National Championship, with Virginia winning. Two fun games, with several great performances from individual players. I’ll leave that to the “big dogs” like ESPN, CBS, and Bleacher Report. 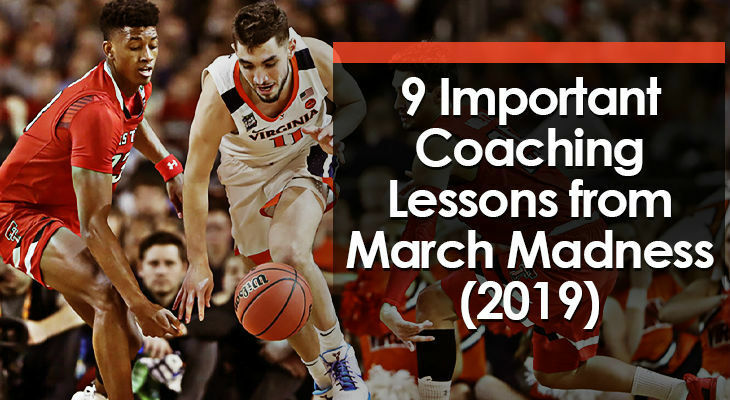 Today, I want to discuss several important coaching lessons that I noticed and spent time thinking about while watching the many games throughout the tournament. I’ll mainly focus on Virginia. Many young players (and their parents and coaches) are obsessed with high school rankings. They want to know exactly where they stand against their peers. And many will complain ad nauseam about how they’re being unfairly treated if they find out that they’re not as high on the list as they believe they should be. But Texas Tech is proving these high school “rankings” don’t mean much. All playing for the National title. I’m not sure of the exact rankings of the Virginia starting five lineup, but I believe they were similar. Stop worrying about these silly lists and focus on improving your shot. This is obvious, I know. According to kenpon.com, Virginia and Texas Tech are both in the top 5 for adjusted defensive efficiency out of the 350+ teams playing Division 1 basketball. Texas Tech only allows their opponents 84.1 points per 100 possessions, which gives them the #1 spot and the best defense in division one college basketball. Virginia isn’t far behind, allowing only 89.2 points per 100 possessions, which places them at #5 in college basketball. But that’s definitely enough time to get a quick catch-and-shoot from the perimeter or even a lob pass to the rim where a Texas Tech player might be able to catch and finish. Instead, not one screen was set and the players barely moved. Resulting in a terrible shot attempt. Coaches: Make sure you have several basketball plays ready for any situation. As soon as the final buzzer sounded, thousands of people on the internet were claiming that Virginia didn’t deserve to win the National Championship. And there is some truth to that. I’ve found that in 99% of cases, teams do need a little “lady luck” to claim the ultimate prize. And Virginia did receive their fair share of luck throughout the tournament. Last year (2018) the Virginia Cavaliers lost in the first round to the UMBC Retrievers. Making them the first #1 seed to lose to a #16 seed in tournament history. But judging from their recent success, it appears the Virginia players were able to use the previous year’s loss to motivate themselves to work even harder to prepare for this year. What a great 2:20 minutes into the mindset of a championship team! To none other than the eventual champions. At one point during the first half of their opening game, Virginia found themselves down by 14 points against Gardner-Webb. Especially when it’s only a 40-minute game, emotions are at an all-time high, and the pressure from the previous year’s loss is undoubtedly running through their heads. But Virginia didn’t lose their cool. They closed to within 6 points a half-time, and ended up winning by 15. Keep playing hard until the final buzzer. Virginia were the slowest team in college basketball this season. Out of the 353 teams in Division 1 basketball, they ranked 353rd in number of possessions per 40 minutes with only 59.4. They would carefully advance up court, set up in their mover-blocker offense or continuity ball-screen offense, and then unselfishly pass the ball around until they found the best shot. And it worked for them (obviously). Other teams (such as Duke and North Carolina), play at a much faster pace and are close to equally effective offensively as Virginia. Find what works for your team. I noticed this happen multiple times throughout the tournament. With a little over 4 minutes to go, Virginia extended their lead to 10 points. That's until Ty Jerome, who was the game's leading scorer with 21 points, committed a very obvious frustration foul in the back court after feeling like he was fouled in the low post only a few seconds earlier. This gave Jerome his 4th foul and he was subbed out of the game. Auburn immediately went on a 14 - 0 run with Jerome on the bench for most of that. This frustration foul could have easily cost Virginia the game. If you do see a player committing one of these or catch them complaining to referees after a missed / bad call, this is a great coaching opportunity to talk to your team about the importance of moving on to the next play immediately. "I was just so frustrated with myself. I let my frustration get the best of me, and I picked up my fourth foul, just a bonehead play. It almost cost us the game. Luckily, we somehow came out on top, so I get another chance to play Monday. But to put myself on the bench and leave my teammates like that in crunch time is a terrible decision." There’s a lot of heartbreak during March Madness. They came within inches of the National Championship game before losing to Virginia after a few tough breaks and several clutch shots from Kyle Guy. Despite the emotions they must have been feeling, they handled the defeat with incredible class. He was baited several times by reporters to complain about the missed double dribble at the end of the Final Four game, but he chose not to. "There is human error involved in the game ... that's part of the game. Get over it." Samir is the player who fouled Guy on his desperation three-point attempt at the end of the game. "We knew these are great officials out there. We knew they were going to let us play, we knew it was going to be a physical game and we wanted it to be a physical game. They missed some calls and they made some calls. That’s why they’re reffing the Final Four, because they’re the best of the best. You have to trust any decision they make on the floor." There were many lessons for basketball coaches and players throughout this year's tournament. More than I could possibly talk about in one blog post. We could have discussed the important differences in Texas Tech's outstanding man-to-man compared to Virginia's tough Pack Line defense. Or looked at how Carsen Edwards from Purdue was able to make a tournament record 28 three-pointers in only four games (the best since Glen Rice in 1989). But we'll end it here. If there were any great basketball or life lessons you took away from this year's tournament, feel free to share them below in the comments section.